The Australian architectural firm Meyer Shircore and associates, member of The Royal Australian Institute of Architects, commissioned two architectural visualizations for their latest apartment building project. The residential building is located in a meander of the Swan River in Rivervale Perth district, West Australia. A building with stepped facades and placed on a hill to offer privileged views over the river. There were two fundamental requirements from the customer that should be reflected in the architectural visualizations. On the one hand, the facade with wires through which vines ascend should occupy a prominent place in the 3D cgi. 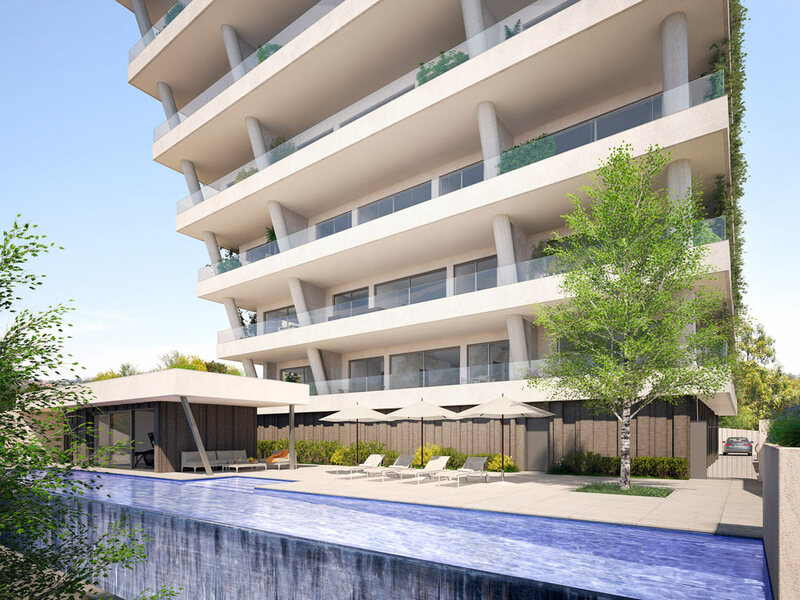 On the other, the pool area should be a space to convey tranquility and become the best meeting point for the apartment’s residents. Several tests were performed so that architects could choose the points of view that best showed the characteristics of the building and at the same time were attractive for use during the commercialization process. Finally, they decided to add to the job a third rendering because they considered that the project was better explained. One of the key points in the modeling of these renderings was the vegetation. The facade vines, trees and bushes were modeled in 3D and should be naturally integrated with the actual vegetation of the in situ photographs so that it was difficult to distinguish the real from the 3D modeling. Finally, note that despite the time difference between us and our customer in Australia, it has been extremely easy to maintain a natural workflow, exclusively by mail. During the day, we were performing the 3D model of the building and at the end of the day we sent the images for review. While we were sleeping the customer could make all the comments and reviews over these images, so the next day, we could start the day knowing all the changes that we should perform on them.